It’s hard to miss the personal touches sprinkled throughout Teaquation & Tonic — the bright blue accents framing the ceiling, the rustic wooden tables adorned with mini pumpkins, and a homely scarecrow nestled against a wall. 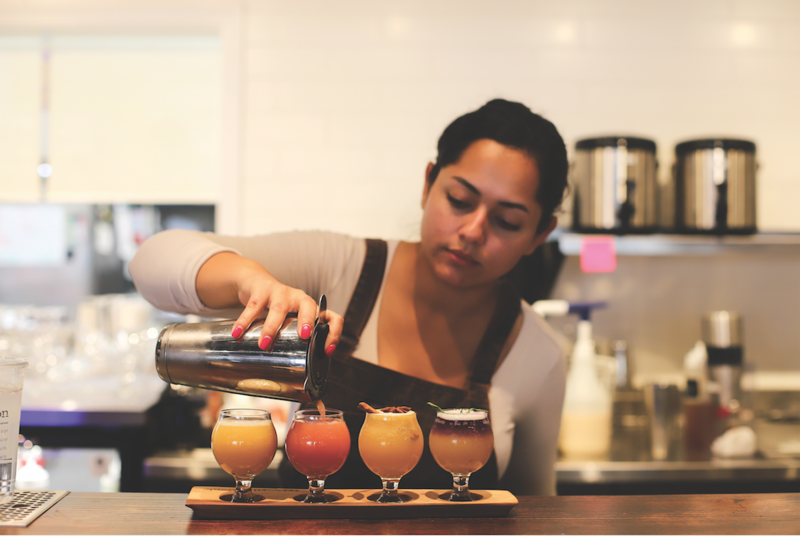 Located on 115 Hamilton Ave., the eatery features a lively combination of bold Latin music, eccentric beverages, and meticulously decorated desserts. Teaquation & Tonic, a restaurant and tea bar that has recently relocated from Redwood City to Palo Alto, was created to promote healthy, delicious foods and drinks. It is the brainchild of co-owner and former tech designer Mercedes Mapua, who decided to leave the industry two years ago to pursue the life of a restaraunteur alongside her husband. When she turned 30, Mapua realized that, in order to maintain a healthy lifestyle, she needed to pay more attention to what she ate. Looking for an air of sophistication and all-natural options, Mapua helped design the menu to reflect her own favorite American meals. “We always try to sell something that’s a different take on an old product, which is … what we’re doing with tea as well,” Mapua says. The Ubé-by Crepe is served with purple yam puree, whipped cream and chocolate sauce. Teaquation & Tonic employee Daisy serves an assortment of beverages available at the restaurant. The Mini Bruschetta Trio, served throughout the day at Teaquation & Tonic, brought a fusion of flavors. The Chicken and Waffles features crispy chicken and a fried egg atop a Belgian waffle. It was this mindset that eventually gave rise to Teaquation & Tonic, whose menu includes a multitude of unconventional foods, such as fried chicken on waffles and pork belly atop baguettes. Teaquation & Tonic’s true specialty is in the Tea Flight, a customer-selected assortment of four teas featuring fruity and tart notes. The teas served are made with all-natural ingredients that reflect Mapua’s commitment to a distinctive experience. Although Mapua has put ample thought into the menu and design of the restaurant, she realizes that every new beginning — including opening businesses — brings its own challenges. Ubé-by crepe ($7): An airy, thin crepe topped with whipped cream, a drizzle of chocolate sauce and ube — mashed dessert yam — came together to create a wonderfully sweet sensation. While this dish is sure to satisfy any sweet tooth, it was, at times, overwhelmingly sugary. Chicken & waffles ($12): Fluffy and light, this plate manages to balance the sweet notes of maple syrup and strawberries with the savory flavors of the chives, egg and a crunchy buttermilk-fried chicken piece. Mini bruschetta trio ($14): Served with six slices of bread, it featured three different assortments of meat and vegetable. The zesty salmon bruschetta was moist on the tongue; the pork belly bruschetta surprisingly spicy, as the drizzled sriracha sauce added intensity; and the mackerel and avocado combination brought both tangy and refreshing elements to the palate. Tea Flight ($16.35): We chose four specialized drinks to complete our tea flight: The Joker, Gold Digger, Pink Cadillac and Star Anise. The mixed drinks brought unexpected and fruity flavors that blended the sweet and tangy elements, but they were oversaturated with sugar.